Click here for the weekend’s complete schedule! 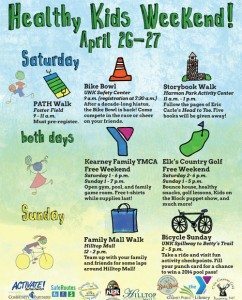 The second annual Healthy Kids Weekend will be taking place in Kearney April 26 and 27. It will be filled with free events, activities, snacks, and prizes for the entire family. 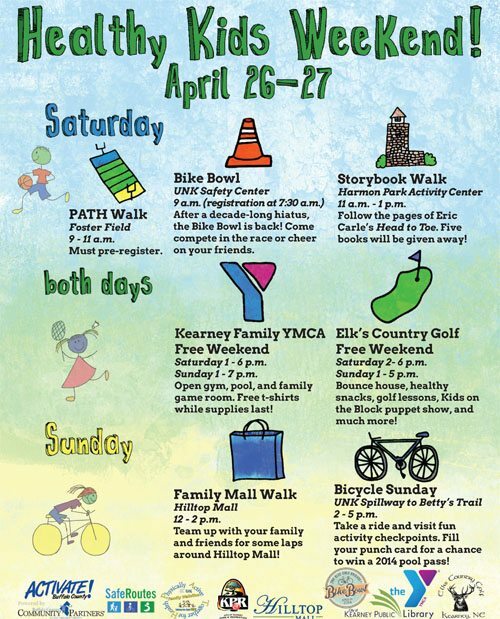 Activities start Saturday, April 26, with the University of Nebraska at Kearney and Kearney Public Schools’ PATH Walk event for pre-registered families. Last year, over 2,300 community members participated in the PATH Walk. For community members who aren’t pre-registered for the PATH Walk, the UNK Alumni Association will be hosting the first Bike Bowl in over a decade at the Ron and Carol Cope Safety Center. Team registration will run through April 21, but the event will be open to the public to watch. From 11 a.m. – 1 p.m., there will be a storybook walk through Harmon Park, presented by Kearney Park & Recreation and the Kearney Public Library. Large pages from the book Head to Toe by Eric Carle will be placed throughout Harmon Park. Participants will venture from page to page, completing activities along the way. In addition, KPR and the library will be giving away five copies of the book to lucky participants. On Sunday, from 12 p.m. – 2 p.m. the Hilltop Mall will be hosting a Family Mall Walk. Partner up with family and friends for a walk around the Hilltop Mall. Also on Sunday, from 2 p.m. – 5 p.m., is Kearney Park & Recreation’s Bicycle Sunday. The loop runs from the UNK spillway through Betty’s Trail and ends at Kearney Cinema 8. Families can start and stop wherever they please and visit activity booths along the trail. Riders who stop at enough booths can turn in a punch card for a chance to win a 2014 family pool pass. On both days, families are encouraged to visit the Kearney Family YMCA, which will have open doors to the public on Saturday from 1 p.m. – 6 p.m. and Sunday from 1 p.m. – 7 p.m. This will include free access to the gyms, pool, and family game room. Free t-shirts will be available while supplies last. Elks Country Golf will also be open to the public both days, from 2 p.m. – 6 p.m. Saturday and 1 p.m. – 5 p.m. Sunday. They will have free mini rounds of golf, free healthy snacks, a bounce house obstacle course, and free golf lessons and challenges, and more. Stop by to say “hi” to Elroy the Elk and watch the Kids on the Block puppet show. Families will also have a chance to win other prizes by picking up an Activate Buffalo County Unplug Challenge punch card at any of the events or at activatebuffalocounty.com. Anyone who completes five of the eight challenges can turn in their card at the Kearney Family YMCA, Kearney Park & Recreation office, or Kearney Area Chamber of Commerce for a chance to win one of the following prizes: Kearney Park & Recreation gift package, $25 Hilltop Mall gift card, Louie the Loper gear, free YMCA birthday party certificate, free YMCA Youth Running Club or Strength Training registration, or an Elks Junior Golf gift certificate. Healthy Kids Weekend is a collaborative effort between Activate Buffalo County, Buffalo County Community Partners, Elks Country Golf, Hilltop Mall, Kearney Family YMCA, Kearney Park & Recreation, Kearney Public Library, Kearney Public Schools, Safe Routes to School, and the University of Nebraska at Kearney, and UNK Alumni Association. For more information on Healthy Kids Weekend, visit activatebuffalocounty.com/healthykidsweekend.